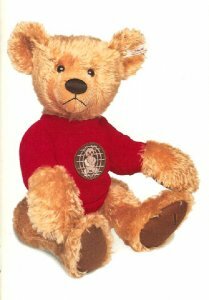 16½/42cm, 1999, Steiff's interpretation of the spokes bear for Good Bears of the World. curly golden mohair, blak floss nose and eyes, wool felt paw pads, red sweatshirt with Good Bears of the Word patch and special Steiff logo pin. Fully jointed. The original Gulliver was a goodwill ambassador for GBW and collected many pins in his travels. Good Bears of the World is a charitable organization that donates teddy bears to children in times of trauma.